Here's one of splicing the mahogony plywood for the facing on the box-spars; they're being glued on the 22 foot table we built out of steel angle on which we'll glue the spar laminations. This plywood is chosen for strength, but it's one of the prettiest parts of wooden wing building. Once it's varnished it'll be a shame to cover it up! 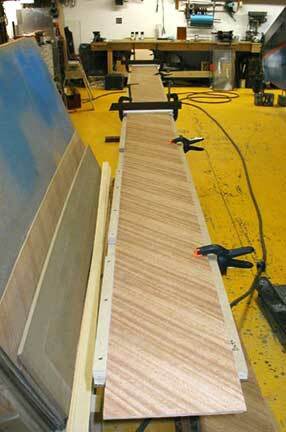 Glued, the 10.1 scarf joints in the 45 degree aircraft mahogony ply, will be the wing's spar web. It will be the face of the 22 foot box-spar (there are four). It's not for looks, although it's beautiful, but for strength.